James Anderson and Monty Panesar produced the most important innings of their lives as England's final pair survived 11.3 overs to pull off a thrilling escape at Cardiff. When Paul Collingwood fell for a monumental 245-ball 74 England still trailed by six, but once Australia had to bat again, valuable time was taken out of the game leaving Andrew Strauss and a packed Cardiff nervously clock-watching. The Australians threw everything into the final hour in an electric atmosphere with the crowd cheering the two unlikely batting heroes as though the Ashes had been won. A vital moment came when Anderson collected consecutive boundaries off Peter Siddle to finally erase the deficit. It meant that two further overs would be lost from the remaining allocation, but there was yet another twist. Australia had bowled their overs quickly during the final hour, which meant it came down to a clock-watch situation for the batsmen. The crucial mark was 6.40pm: at that point it meant there was no time for Australia to start a run chase. The closing overs were in the hands of Nathan Hauritz - who rose above all the pre-match concern over his quality to claim three final-day wickets and six in the match - and Marcus North. Anderson, outwardly calm while inside he must have been churning, blocked confidently but also picked up vital runs to just edge the lead ahead further. Meanwhile, Panesar, the most unlikely of batting saviours, watched the ball like a hawk. Having left expertly against the quicks he played with soft hands against the spinners, and one of the biggest cheers of the day came when he square cut North for a boundary. However, while Anderson and Panesar were there at the end to soak up the acclaim the escape wouldn't have been possible without one of Collingwood's most determined innings for his country. He came in early after Kevin Pietersen lost his off stump, shouldering arms to Ben Hilfenhaus, and soon faced an England card that read 70 for 5. He found vital support from Andrew Flintoff, Stuart Broad and particularly Graeme Swann, who overcame a peppering from Siddle, to share a 20-over stand. Collingwood fought with every ounce of the grit that makes him such a valuable player. He survived some early scares against Hauritz when an inside edge fell just short of Simon Katich at short leg and another delivery almost rolled back onto the stumps until Collingwood stepped on it. He went 31 deliveries after lunch without scoring, but unlike some of England's other batsmen he isn't someone who gets overly twitchy when his own score isn't moving along. Collingwood's fifty came off 167 balls, the slowest by an England batsman since Nasser Hussain against West Indies in Port of Spain during the 2004 tour, but the pace of his innings mattered not a jot. His only mistake proved his downfall as he chased some width from Siddle and Mike Hussey took a juggling catch in the gully. He could hardly believe what he had done and couldn't even bring himself to remove his pads as he watched the two tailenders defy Australia. Collingwood isn't a superstar; he doesn't fit into the hero mould, but here he was both. 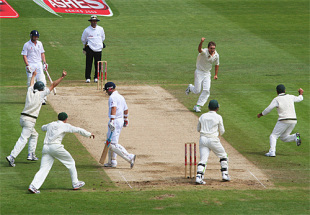 Ponting admitted it was a tough result to take and Australia were ahead of the game virtually throughout the final day. Pietersen, who had an early-morning confrontation with Mitchell Johnson during the warm-ups, never settled against the swinging ball as the quicks probed away on the full length that causes him problems. His troubles ended when he completely misjudged the line from Hilfenhaus and didn't offer a shot. It was excellent bowling from Hilfenhaus, who had been shaping the ball away and made one hold its line, but Pietersen's back lift and footwork are currently not in sync. In the eighth over of the session it was time for Hauritz and he was in the wonderful position of being able to bowl with men around the bat. He immediately found more turn, and posed a greater threat than England's spinner managed over two days, and made one bounce a touch more against Andrew Strauss as he tried to cut. While the England captain can perhaps be partly excused his shot as the cut is a legitimate option against the offspinner, the same can't be said for Matt Prior. He had already flirted with danger by dabbing Hauritz through short third man and had also been beaten twice outside off stump by clever changes of pace and flight. Trying to go through the off side again he was undone by extra bounce and gloved a chance to slip. Flintoff fought against his natural inclination to attack, playing watchfully against Hauritz as he accompanied Collingwood for 23 overs. The out-of-sorts Johnson, who was later horribly wayward with the second new ball, broke through when Flintoff pushed at one going across him and before tea Broad had also gone, trapped leg before playing back at Hauritz. For Hauritz it appeared he would provide the ultimate response to his critics by securing a Test victory until he tired slightly in the tension-filled closing stages. Collingwood and Swann took a large chunk out of the evening session, with Swann completing an impressive match with the bat. Shortly before tea he was given a peppering from Siddle who sent down a violent over that struck three painful blows - two on the glove and one on the elbow - which required the physio to come out twice in three deliveries. His runs were also crucial as England ate away into Australia's lead before he went for a pull against the impressive Hilfenhaus and was palpably leg before. Collingwood now had just two bowlers for company and when he departed an Australian victory looked assured. 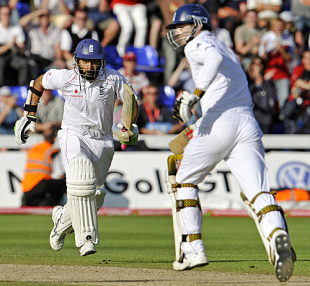 England, though, dug deep, deeper perhaps than many thought Anderson and Panesar could. However, despite the scoreline still reading nil-nil the reality is that England were a distance second-best for much of the match. Australia have shown that, despite the loss of many greats, they are a unit of huge desire who will take some beating. At least this time, though, it won't be a whitewash.